A Syrian woman and a child, evacuated from the city of Aleppo arrive at a refugee camp in Rashidin, near Idlib, Syria, Dec. 19, 2016. A plan, so far opposed by Damascus, envisions the creation of civilian safe zones in northern parts of Syria. According to Turkish officials, President Recep Tayyip Erdogan will advocate for the establishment of the zones in his talks with his Russian counterpart, Vladimir Putin, during a visit to Moscow this week. Ankara long lobbied for a safe zone in northern Syria but was repeatedly rebuffed by the Obama administration, notably in 2013 and 2015, amid concerns in Washington that protecting it would entail putting a significant American force on the ground, drawing the U.S. deeper into the conflict in Syria. On January 25, he said the U.S. will “absolutely do safe zones in Syria” for people displaced by the six-year conflict. The U.S. president has not mapped where zones would be located. He has asked the Pentagon and State Department to draft plans, although he has omitted that instruction from recent executive orders. FILE - Turkish President Recep Tayyip Erdogan (L) speaks to Russian President Vladimir Putin during their meeting in St. Petersburg, Russia, Aug. 9, 2016. Erdogan is expected to raise the issue of safe zones in Syria during talks with Putin in Moscow this week. The Turkish Foreign Ministry applauded Trump’s January call for setting up the havens, saying, “Setting up safe zones is something Turkey has advocated from the start.” Ankara, however, is wary of any U.S.-supported zone being proposed for territory controlled by Syrian Kurds. Turkish officials, speaking on condition of anonymity to VOA, say that the circumstances have changed dramatically on the ground since their past big lobbying efforts to secure backing for the establishment of safe zones. With Russia’s military intervention in the Syrian war, Assad apparently secure, U.S. special forces on the ground in the Kurdish-controlled northeast of Syria and fragile and tentative cooperation under way in the fight against the Islamic State terror group, the time has come for safe zones to be taken seriously, Turkish officials say. FILE - A Turkish flag flies at a camp for Syrian refugees in Islahiye, Gaziantep province, southeastern Turkey, March 16, 2016. In the past, Turkey’s push for safe zones was seen as tied to its eagerness to oust Syrian President Bashar al-Assad, but now appears more linked to Ankara's desire to stem the flow of refugees. In the past, Turkey’s push for the havens was seen as being tied to its eagerness for Assad’s ouster - the zones would have served as protected bases for Syrian rebels, both Damascus and Washington feared. Now, the Turks are marketing the safe zones not as part of a broader effort to topple Assad, a policy aim they have largely abandoned, but as a way to stem the flow of refugees to the West. According to Turkish and Western officials, the safe zones proposal was floated at this week’s unusual three-way meeting in southern Turkey among the top commanders of the U.S., Turkish and Russian armed forces. The U.S. Chairman of the Joint Chiefs of Staff, Gen. Joseph Dunford, had already been lobbied by the Turks on the issue last month during meetings with Turkish military officials. Under the Turkish plan, a formal buffer zone would be established between Afrin, northwest of Aleppo, Syria, and Ayn al-Arab, northeast of Aleppo. A large part of the proposed Turkish zone already corresponds with a swath of land in northern Syria cleared by the Turks and Syrian rebels they back in Operation Euphrates, a military intervention launched last August and aimed at pushing back Kurdish militias and jihadists as much as possible from the Turkish border. Turkey also proposes providing hospitals, large kitchens, and other amenities for the zone. Turkey’s advocacy of a large safe zone in northern Syria isn't as innocent as presented, say Syrian Kurds. They see the proposal as mainly aimed at them and largely an effort by the Turks to prevent Kurdish-controlled territory from becoming a safe zone, one that could be turned into a Kurdish mini-state. 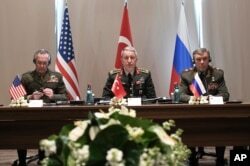 FILE - Turkey's Chief of Staff Gen. Hulusi Akar, center, U.S. Chairman of the Joint Chiefs of Staff Gen. Joseph Dunford, left, and Russia's Chief of Staff Gen. Valery Gerasimov attend a meeting in the Mediterranean coastal city of Antalya, Turkey, March 7, 2017. Among the items discussed at the unusual meeting was the creation of safe zones in Syria. And the Kurds and other critics say Ankara’s safe zone proposal is a Turkish bid to carve out its own de facto mini-state in northern Syria, one in effect endorsed by Washington and Moscow, whose protection would be guaranteed by U.S. military power. “Turkey is currently shaping a de facto safe zone between Afrin and Jarablus along its border with Syria, part of a demographic battle with the People's Protection Units [YPG] that represents Syrian Kurdish forces,” argues Joe Macaron, a policy analyst at the Arab Center, a non-profit research organization in Washington. Speaking at a conference last week at the Global Policy Initiative, a Washington-based research institution, Walid Phares, an analyst who advised the Trump presidential campaign, said there are many important challenges to the proposal for safe zones. “One is where to establish them, two is who will manage them, three is who will fund these zones, and last but not least, is there a regional and international consensus over this initiative,” he said. Other key questions, according to analysts at the conference, are: how long the safe zones would be in effect and would they in the end result in Syria being broken up along ethnic lines? Of all the powers involved in discussions about safe zones in Syria, Russia’s position will be crucial, said Ilan Berman of the American Foreign Policy Council, a research group in Washington. The Kremlin sees the proposal of safe zones as “a starting point for negotiations with the U.S."
“The Russian government wants guarantees the zones will bring stability and also that they will not be used as platforms for regime change," Berman added.